Earth Heal Blog: Join Us for the Solstice Distant Healing Event on Wednesday, 21 June 2017! Join Us for the Solstice Distant Healing Event on Wednesday, 21 June 2017! The Earth Heal Geoharmonic Research Project will be hosting a group distant healing event for participants around the world on the Solstice, Wednesday, 21 June 2017. Each participant will receive distant healing work as an individual and as part of the group, and will play a part in holding the energy for the morphic field and the planetary side of the healing. Our event will begin at 17:00 or 5 pm GMT/Universal Time and continue for about 4 hours, ending around 9 pm GMT/Universal Time. To check the starting time of this event in your part of the world, please go to this link. All people and animals everywhere in the world are welcome to join us as once-off participants on an exchange basis of your choice or by opting for annual membership to Earth Heal, and being included in all our distant healing events for the coming year. The treatment will include around 200 participants globally, and will be facilitated in Bahia, Brazil by Edna Spennato, working under guidance from the collective Higher Self of the group via the healing method known as Synchronization Harmonics, pioneered by Edna in 1998. Four surrogates in Brazil, Argentina, the USA and South Africa will anchor incoming healing energy during the treatment process and release the energies that are "no longer needed" on behalf of the participants and the planetary morphic field as a whole. All links related to participation in the event can be viewed via this link. For info about annual membership to Earth Heal, please go to this link. When is the solstice where I live? The solstice takes place place on June 21, 2017 at 4:24 UTC. That’s 11:24 p.m. CDT in North America on June 20. A solstice happens at the same instant for all of us, everywhere on Earth. To find the time of the solstice in your location, you have to translate to your time zone. For the Northern Hemisphere, this solstice marks the longest day of the year. Early dawns. Long days. Late sunsets. Short nights. The sun at its height each day, as it crosses the sky. Meanwhile, south of the equator, winter begins. What is a solstice? Ancient cultures knew that the sun’s path across the sky, the length of daylight, and the location of the sunrise and sunset all shifted in a regular way throughout the year. They built monuments, such as Stonehenge, to follow the sun’s yearly progress. Today, we know that the solstice is an astronomical event, caused by Earth’s tilt on its axis and its motion in orbit around the sun. Because Earth doesn’t orbit upright. Instead, our world is tilted on its axis by 23-and-a-half degrees, Earth’s Northern and Southern Hemispheres trade places in receiving the sun’s light and warmth most directly. 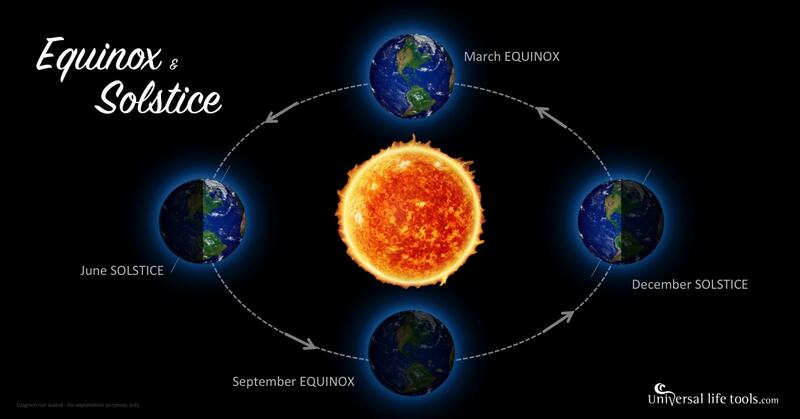 At the June solstice, Earth is positioned in its orbit so that our world’s North Pole is leaning most toward the sun. As seen from Earth, the sun is directly overhead at noon 23 1/2 degrees north of the equator, at an imaginary line encircling the globe known as the Tropic of Cancer – named after the constellation Cancer the Crab. This is as far north as the sun ever gets. All locations north of the equator have days longer than 12 hours at the June solstice. Meanwhile, all locations south of the equator have days shorter than 12 hours. Day and night sides of Earth at the instant of the June solstice (2017 June 21 at 4:24 UTC). It has been universal among humans to treasure this time of warmth and light. For us in the modern world, the solstice is a time to recall the reverence and understanding that early people had for the sky. 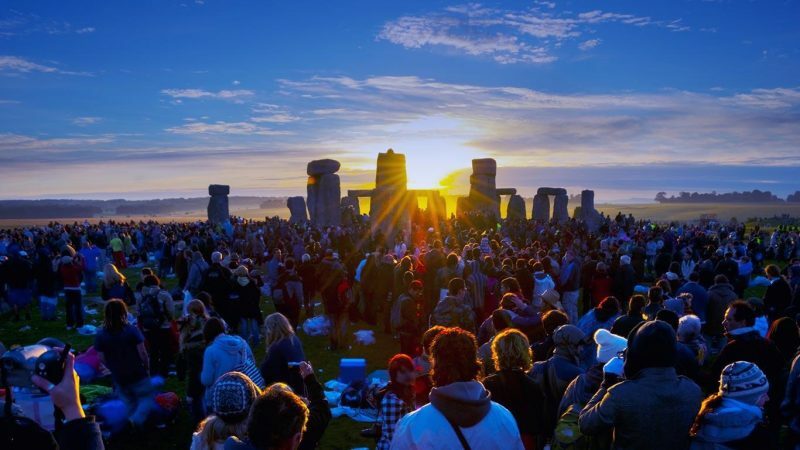 Some 5,000 years ago, people placed huge stones in a circle on a broad plain in what’s now England and aligned them with the June solstice sunrise. The Solstice is an opportunity to harmonise our rhythms with the solar cycle and to utilise the powerful incoming energies available for personal and planetary healing on this special day. During the treatment process, each participant will receive healing on an healing on an individual level and as being part of the work done for the group of participants as a whole, and will also be anchoring the planetary healing energies in their part of the world, releasing disharmonic energy and receiving healing energy on a collective level. We use a cutting-edge distant healing method known as Synchronization Harmonics, and for those who have never before experienced distant healing work, this is the ideal opportunity. After each healing event, feedback and detailed reports about what came up during the treatment process for the group, as well as for the collective consciousness on a planetary level, are mailed to participants. First-time participants should send their details and pics to us at earthhealadmin [at] gmail [dot] com as soon as possible, and no later than 2 pm GMT/UTC on Wednesday, 21 June 2017. Please forward this link to those who may be interested. We host several group distant healing events annually - every Equinox and Solstice, as well as significant dates in between. 22 September 2017 - Equinox - More info to be posted soon. Anyone can participate in any of our group distant healing events on a purely donation basis, without becoming an Earth Heal member. Participants are worked on as individuals and also assist in anchoring the incoming healing energy on behalf of the collective energy field. Our next big group distant healing event will be on the 22 September - Equinox. More info to be posted soon. Becoming an annual member of Earth Heal ensures that one is included as a participant in all of the distant healing events held regularly throughout the year (usually 8 altogether). For more info about annual membership, please go to this link. For info about how to pay for your annual membership, please go to this link. All links in this blog should appear in GREEN text like this. This turquoise colour is used only for highlighting key words and phrases, and is NOT used for links. The Earth Heal Geoharmonic Research Project provides distant healing work to people, animals, groups, buildings, areas of land and water, and the collective energy field shared by all. More about our work here and here. 17 May 2011 - Wesak Full Moon event for Abundance for All - focus on Moundville, U.S.A.